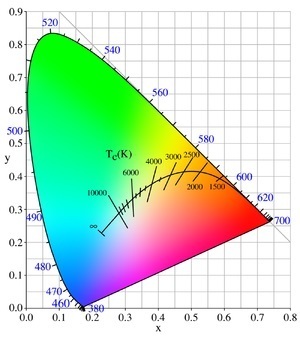 Color temperature is a characteristic of visible light that has important applications in lighting, photography, videography, publishing, manufacturing, astrophysics,horticulture, and other fields. Color temperatures over 5,000K are called cool colors (bluish white), while lower color temperatures (2,700–3,000 K) are called warm colors (yellowish white through red). 1> Warm Color, 2700-3300K, it creates a warm, relaxed and comfortable feeling.It's suitable for residential, hospitals, hotels and some places with low temperatures. 2> Natural white, 4000-45000K, this color gives people a soft, comfortable, serene feeling. It's suitable for shops, hospitals, hotels, restaurants, waiting rooms and other places. 3> Pure white, 5000-5500K, this color can give people sprightly, clean and bright feeling and it's suitable for shopping malls, supermarkets, offices, hospitals and so on. 4> Cool white, 6000-6500K, this color gives people a clean, brightfeeling, makes people focus, and is suitable for offices, conference rooms, classrooms, design room, reading room, exhibition Windows and so on.